This week, b.Blunt talks to Jasmine Rundall, a cannabis events coordinator, wedding planner extraordinaire and owner of Blue Dream Brides. Based in Arizona, Blue Dream Brides is quickly becoming one of the top cannabis event companies for locals and tourists looking to celebrate their canna-love with an elevated experience. Canna-couples are using Blue Dream Brides as a one-stop shop to find the right cannabis-forward vendors and venue for their big day. From curating beautiful cannabis floral arrangements, to finding a baker to make a cannabis wedding cake, edibles or a cannabis infused chocolate fountain, Jasmine and her team will get it done. You can even ask them to find a transportation company that comes with a joint rolling concierge or hire bow-tied “budtenders” to man the open bud bar. No matter what you desire, Blue Dream Brides create a one-of-a-kind experience for your special day. You can also meet Jasmine at the 2019 Cannabis Wedding Expo in Denver, Colorado on March 3, 2019. Blue Dream Brides is a cannabis inspired wedding and event company. How did you come up with the idea/concept? The first time someone said “cannabis wedding” to me, I literally laughed. I thought it sounded so silly. I had only been consuming cannabis for about a year, I just barely took my first steps into the industry, I truly knew nothing about cannabis culture and had only been to a few networking events. But as I become more involved with the community, industry, and the plant itself, cannabis-weddings became an idea that I just couldn’t shake.With plenty of event planning experience and a few internships in the wedding industry, I’d had the idea of starting my own wedding business for a long time but never quite found the drive or push I needed to make it a reality….. Until cannabis! Once the idea hit, everything sort of just clicked, including the name.After doing more research and connecting this our amazing graphic designer, Leicie Piscetelli of Ox & Plow, our cannabis wedding + event business was born! Tell us more about the services you offer. Our specialties are cannabis weddings and bridal events (bachelorette parties, rehearsal dinners, etc). All couples have different needs for their weddings so Brides and Grooms can choose from plenty of different wedding packages when hiring us! Whether they need an all-inclusive planner or a simple day-of coordinator, Blue Dream Brides does it all.In addition to serving our brides and grooms, we also work with local cannabis businesses to coordinate launch events, professional/networking events, parties/events for dispensaries and more! Finding the cannabis industry was truly my saving grace. College wasn’t going well and I couldn’t find passion in anything I studied. An impulsive decision back in March to attend a networking event is really where it all started. It had never occured to me that there could be so much opportunity in this industry already.Seeing so many amazing women working to support each other has truly been my inspiration to push through the hardships of working in such an underdeveloped industry. I meet women daily who are filled to the brim with new ideas and dreams for the future of our industry. Everyday is another opportunity to work with someone, meet someone new, connect with a brand you’ve been admiring for awhile, etc. You never know what is right around the corner in this community and I love that! In your opinion what is the biggest challenge in the cannabis industry right now, specifically for women? What motivates you to keep going? I think my most frustrating struggles are shared by many; navigating such a new and underdeveloped industry. There’s a lot of good in the Cannabis industry and we are developing at an amazing rate. But there’s still plenty of progress to be made. Event planners want to know that every single detail is set in stone when coordinating something for their client. When working in this industry you have to be prepared for change at any moment. For example, in July of last year, Arizona deemed concentrates unprotected by the AMMA. This change happened over night with barely any word. The next morning we woke up and it was no longer legal to have a dab bar or any concentrates at a wedding. This is a huge setback for clients who are planning their entire event around cannabis and consumption.There are days where the world of cannabis becomes overwhelming. It feels like it’d be easier to step back and wait for others in the industry to find sturdier ground. But we are too passionate about CannaLove to abandon ship. We’re Arizona’s original cannabis wedding + event service. We’re grateful everyday to be a part of the Arizona Cannabis Community and help couples celebrate their love for each other and Mary Jane! 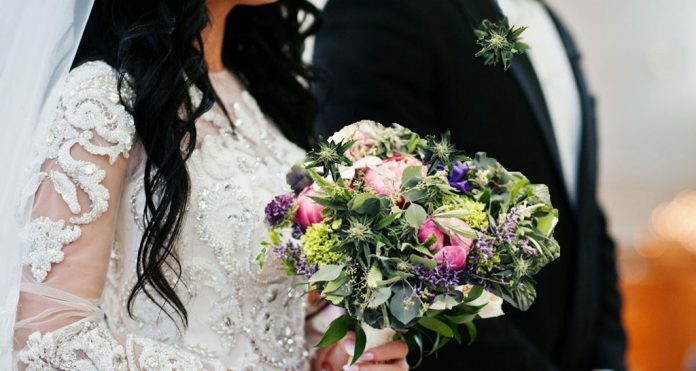 Do you have any advice for brides to be that want to have a cannabis themed wedding? Whether your state is recreationally legal or only medically legal, hire a wedding planner who has expeience with cannabis weddings. There are a lot of details that need to be arranged according to your state’s laws and limits. Having a planner who knows the legal ins and outs of a cannabis wedding will save brides so much time and stress. And that is applicable to non-cannabis brides too. A wedding planner if your best friend and should be a priority if the budget allows it. Blue Dream Brides is located in Phoenix and we love our cannacommunity! We have tons of vendors that put on frequent events for both medical patients and non. We have opportunities for networking and career events like Cannafriends and Women Grow. And we also have social events like Pink Kush and Errl Cup. Being a medical state does limit the people that can attend events, but this is another thing we look forward to moving past with federal legalization! You can email us at bluedreambrides@gmail.com, call/text us at ​(480) 744-4275, or follow us on FB + Insta @BlueDreamBrides! Previous articleParlez-vous Francais? Allume will get you Lit.